Mike Greene, 45, of Harvest & Scott Butler, of Madison, took first- & second-place overall, respectively at a 5K Monday in Fairview, which is in Cullman County. Click here to go directly to Mike's blog post about the Fairview race or click his name above to visit his most recent update. 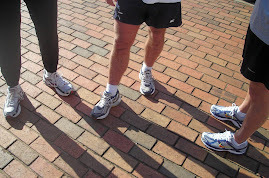 Results from the Sacred Heart 5K in Lawrenceburg, Tenn., are posted at ShoalsTrac.com. A handful of Limestone runners made quite a showing at the race. Bud Bowen, 59, of Elkmont, earned second-place overall in 20:46. (Though I'm not really sure if the results listing is entirely accurate because that time is actually 40 seconds slower than the guy listed at first-place Male Master and a similar issue exists between the Top Three Overall Females and the Top Three Female Masters). UPDATE! : Thanks to mgreene who left the following comment to explain my confusion on the results as noted above: The reason the results seem funny, is that they give away money to the top 3 overall and top master. Sometimes, so as not to hurt anyone, they juggle the results so everyone maxes out on cash prizes. No juggling of time, though! Hyunsook Clark, 42, who actually hails from Huntsville but is running buddies with Athens' Phillip Dean, took the second-place award in the Female Masters category with a finish time of 26:03. Phillip, 54, took an age-group third in 26:57. Barry Pugh, 40, of Elkmont, took third Male Master in 22:45. The 37th annual Monte Sano Road Races, a Huntsville Track Club event, drew hundreds of runners Saturday morning with 313 finishers in the 10K and 491 in the 5K. Click on the above links to go directly to the 10K or 5K age-group results as posted on the HTC website. Before we get to the Limestone runners, I'd like to give Mr. Jim Howell a big old cyber-pat-on-the-back. At 87, Mr. Howell was the senior-most runner in the 10K race and was the lone finisher in his 80+ age group. Go, Mr. Howell! Whitney Hollingsworth,44, was the Female Masters Winner, with a finish time of 46:12. Another shout-out, here, this time for Gene Simonson, 84, of Huntsville, who was the senior-most finisher in the 5K and, like Mr. Howell in the 10K, was the sole runner in his age-group.